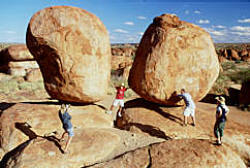 Scattered across a wide, shallow valley, these granite boulders are precariously balanced on top of one another. This environment provides shelter for much of the wildlife and fauna found across the arid centre of Australia. Sacred to the the traditional owners of the area, the Warumungu, who believe the boulders are the eggs of the Rainbow Serpent. A 15 min. self guided walk is accessible from the western side of the road (day use area) and there is a network of walking tracks for you to find some solitude in this special place.